Throughout Prague there are a large number of statues. During November 2011 some of them became readers of books. 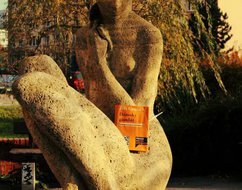 During A Book for a Statue, certain Prague sculptures read both Czech classics and contemporary authors as well as prose, poetry and educational books. The reading statues could be found in the city centre as well as the estates on the outskirts of Prague.